KUCHING, 16 April 2012 – All the three teams from The National University of Malaysia (UKM) taking part in the Malaysian Universities Sports Championship (MASUM) 2012 at the University Malaysia Sarawak campus here last week top their groups. However only the women futsal team managed to advance to the semi finals after beating the International Islamic University team at the quarter finals but lost to the University of Malaya team to gain just a third placing. The other two teams, futsal men and tennis men lost at the quarter finals respectively to Sultan Idris Teaching University (UPSI) and University Malaysia Terengganu (UMT). 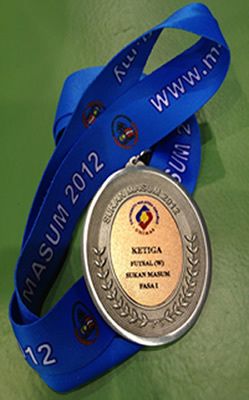 Nearly 2000 Athletes and officials from 20 public universities in the country took part in the first phase of MASUM 2012 held here last week in eight sports each for men and women. Deputy Leader of the UKM contingent, Dr Tajul Arifin Muhamad was generally satisfied with the performance considering UKM sent only a contingent of just 40 athletes. He was confident that the team will perform better once UKM was able to have a futsal court of its own. Deputy Vice Chancellor (Students and Alumni Affairs), Prof Ir Dr Othman A Karim headed the UKM contingent. The second phase of MASUM 2012 will be held at the Tun Hussein Onn University (UTHM) later this year.